Among the orange and olive trees in our garden there’s a lone pomegranate tree. It doesn’t stand out particularly – you’d never give it a second glance if it wasn’t for its beautiful fruit in different states of ripeness. Some green and others cricket ball red. 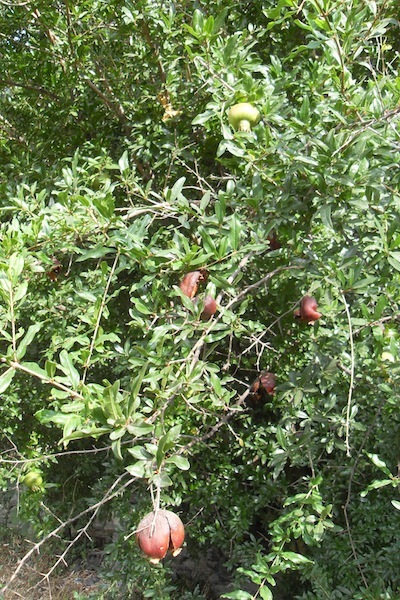 Writing this post in 34C heat with hard earth beneath one’s feet, it’s no surprise the pomegranate thrives in hot climates, as it’s done for millennia – from Iran and India to Spain and Latin America, where it was introduced by the Spanish in the late 1760s. 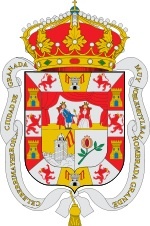 We may be one of the few people who didn’t know that the city of Granada was named after the fruit. Simply, Granada means pomegranate in Spanish (the French military, noting the size and shape, also named the grenade after it). Its original Arabic name – Gárnata (thought to mean ‘hill of strangers’) – became Granada and the city adopted the pomegranate as its official symbol. 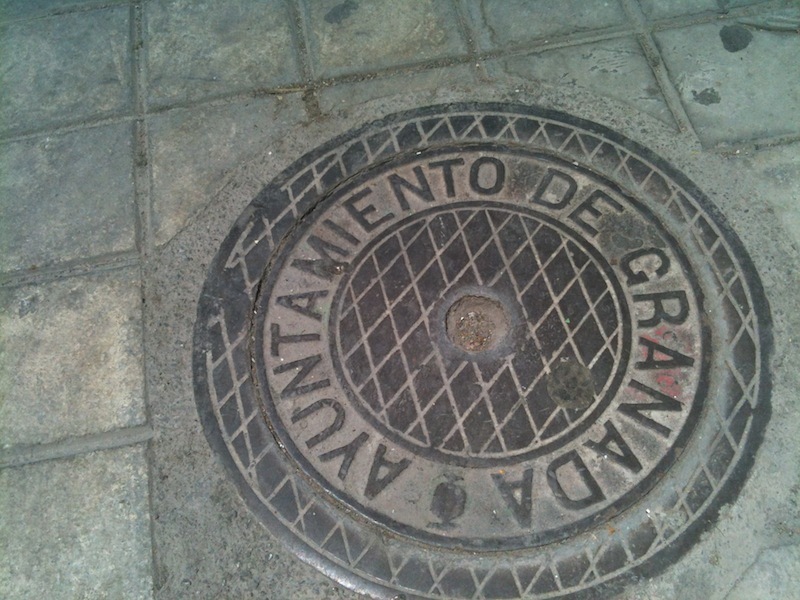 It can be found on the city’s coat of arms as well as streets signs and even manhole covers. Back home we largely ignored the fruit but before we left a friend made a drink – Cava with pomegranate seeds added – simple but delicious. And of course Grenadine syrup is used in cocktails. But it’s not just cocktails and salads where pomegranate seeds (arils) are sprinkled on top. An Iranian recipe – fesenjãn – a sauce made from walnuts and pomegranate juice is added to chicken/duck and rice dishes. Dried seeds are also used in Indian chutneys, Greek dishes – for example, kebabs, can be glazed with pomegranate juice, and the Mexican dish chiles en nogada – the red seeds representing the red bit of the country’s flag (peppers the green, the sauce the white). The pomegranate has been used throughout history and in almost every religion as a symbol of life, death, fertility, marriage, abundance and prosperity. Botticelli may have included it in his painting ‘Madonna of the Pomegranate‘ (1487), but the Egyptians, Greeks and Romans all included it in their art, mythology and literature many moons before. From being thrown at walls at Armenian weddings (the split seeds ‘ensuring’ future children), its use as a female contraceptive – to stopping nose bleeds and helping treat haemorrhoids – the pomegranate sure has its uses. And like anything eaten or drunk nowadays, reports pop up from time to time stating its health benefits – like lowering blood pressure. 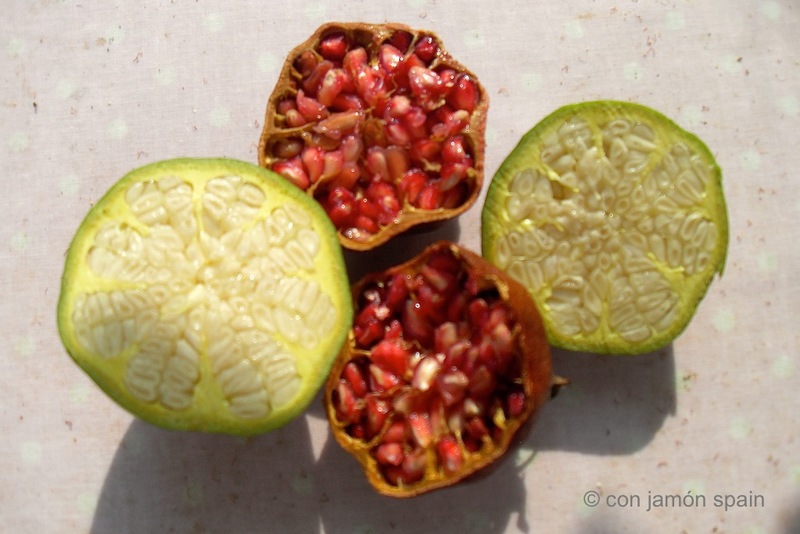 Now, where’s that knife and chopping board… (How to de-seed a pomegranate). Here’s a photo we took today of two pomegranates from our garden – and a manhole cover on our last visit to the magnificent city! I love them… the fruit, the trees, the flowers – everything! Despite their pipsiness. The pipiness is what S struggles with – but it’s soon forgotten when drenched in Cava!